Valley School Board Member, Carl W. Crabtree receiving his award from the Ohio School Boards Association’s Southeast Region. Left to Right: Paul Mock - Regional Director of OSBA and Carl Crabtree Valley School Board. 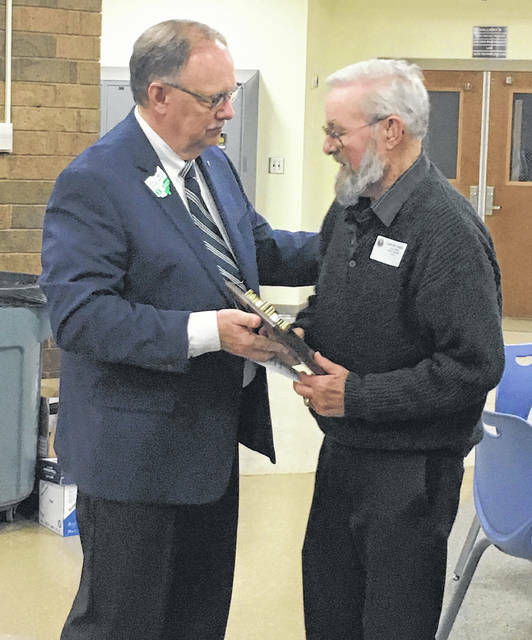 School board members come and go throughout the years, so it is not often that one member has retained his seat for 51 years, but Valley School board member Carl W. Crabtree has done just that. Crabtree, was recently recognized at the Ohio School Boards Association’s Southeast Region Spring Conference by receiving the Veteran School Board Member Award. The Veteran School Board Member Award recognizes school board members who have served 10, 15 and 20 years on their local school boards. Crabtree was recognized for 50 years of service. The Ohio School Boards Association conference was held at Pike County Career Technology Center in Piketon on March 19th. And it was at that time that Crabtree received his award. According to Scott Rolfe, Superintendent, Crabtree was elected as a Valley School Board member in the fall of 1967. He has served consecutive terms since 1968. Rolfe also said that during his tenure as a board member, Crabtree has only missed four meetings in the 51 years. And, the last meeting he missed was in 1994, making it now, 25 years without missing a meeting. How many people can say that? “He is still active in our community; he attends all home football, girls and boys basketball and many baseball and softball games,” Rolfe said. “The Valley Local School District has been blessed with this man; he continues to be a great resource for other (board of education) members and the superintendent. An honor bestowed upon a man who has served his community well is something worth mentioning, so all may hear about it. Congratulations should be noted for Carl W. Crabtree, for a job well done. Valley School Board Member, Carl W. Crabtree receiving his award from the Ohio School Boards Association’s Southeast Region. Left to Right: Paul Mock – Regional Director of OSBA and Carl Crabtree Valley School Board.